United Poultry Concerns is joining Wisconsin-based Alliance for Animals again this year in politely urging the village of Ridgeland in Dunn County, Wisconsin to cancel the “Chicken Toss” in February (most likely Saturday, Feb. 16th since it is always held in mid-February although we could not confirm the date as yet). 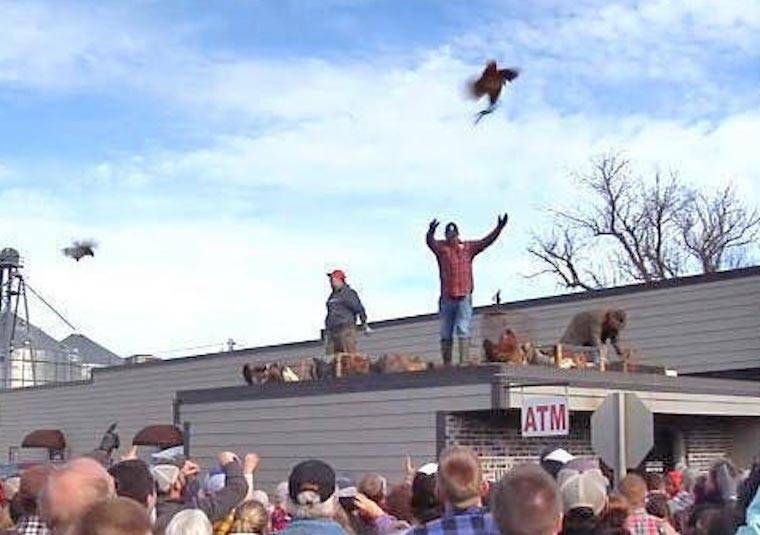 The chicken toss consists of throwing many chickens, one or two at a time, up in the air from a roof. Crowds scramble to grab the birds as they fall to the ground. The chickens huddle together, freezing and fearful, in crates and bags waiting to be thrown by participants who consider this activity fun. There is no similarity between a chicken being pulled from a container and thrown roughly up in the air from a roof in the midst of a screaming mob, and a chicken fluttering voluntarily to the ground from a perch in a quiet place. Please call these Dunn County officials, and politely urge them to prohibit the “chicken toss” this year. Whether you reach a live person or a recording, leave a brief, clear, and respectful message expressing your concern for the chickens: their fear and possible injury and the frigid weather.